WEST LAFAYETTE, Ind. 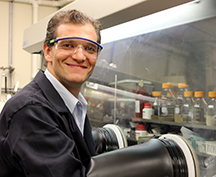 - A Purdue University innovator is commercializing technology that creates high-value, renewable chemicals used in the flavor and fragrance industry from wood lignin and that could make biofuel production more efficient. Mahdi Abu-Omar, president and founder of Spero Energy Inc. and the Purdue R.B. Wetherill Professor of Chemistry and Chemical Engineering, said these industries face challenges to make their products in a more efficient, environmentally friendly and cost-effective manner. "The chemicals used by the flavor and fragrance industry are some of the most expensive and high-value substances produced in today's market," he said. "Currently those chemicals are made from petroleum. We have developed a method to convert wood lignin into valuable chemicals for both the flavor and fragrance industry at a lower cost and a method to improve production for the biofuel industry." Abu-Omar said the technology is a single-step catalytic process that converts lignin in wood into two products: dihydroeugenol, which is a valuable chemical used in the flavor and fragrance industry, and lignin-free material that could be used for the production of biofuels. "Flavor and fragrance companies now have the option of producing dihydroeugenol, which has a spicy and sweet odor and flavor, from renewable rather than petroleum-based resources," he said. "Biofuel companies now could produce more biofuels from the same quantity of wood and wood byproducts because the lignin has been removed." Spero Energy has an exclusive option to license the technology through the Purdue Office of Technology Commercialization. A video about Spero Energy is available at https://www.youtube.com/watch?v=90u01yi7pMk. Spero Energy has received a six-month SBIR Phase I grant from the National Science Foundation worth $150,000 and a nine-month SBIR Phase I grant from the Department of Energy worth $149,882. Company officials also won the 2014 Midwest Clean Energy Challenge Biofuel Prize. Abu-Omar said the company has business plans for both the flavor and fragrance industry and the biofuel industry, plans to scale up its production, and looks to validate its products for the flavor and fragrance industry. "We are looking for investments and joint ventures with a chemical company that has manufacturing experience, which will help us further develop our products for the flavor and fragrance industry," he said. "We also are looking to scale up our production so we can have an impact on the worldwide biofuels market." Abu-Omar said Purdue's entrepreneurial atmosphere has benefited Spero Energy. "The Purdue Foundry and Purdue Office of Technology Commercialization have been critical allies in developing our business plans, making connections with knowledgeable people and providing access to business and legal assistance," he said. Spero Energy is one of 24 startups based on Purdue intellectual property that were launched in the 2014 fiscal year. For information on other Purdue intellectual property ready for licensing and commercialization, visit http://www.otc-prf.org. For more information about available leadership positions, investing in a Purdue startup or licensing a Purdue innovation, visit http://www.purduefoundry.com. Spero Energy Inc. is an Indiana-based technology company with the mission of developing cost competitive conversion of non-food biomass feedstock to high value chemicals (HVCs) and renewable fuels. Spero Energy is developing processes for a range of renewable specialty chemicals targeting flavor and fragrance ingredients, high-performance materials and pharmaceutical markets. For more information, visit http://www.speroenergy.com. The Purdue Office of Technology Commercialization operates one of the most comprehensive technology-transfer programs among leading research universities in the U.S. Services provided by this office support the economic development initiatives of Purdue University and benefit the university's academic activities. The office is managed by the Purdue Research Foundation, which received the 2014 Incubator Network of the Year from the National Business Incubation Association for its work in entrepreneurship.